My Creative Existence: Lavender and Lime! This colour combo is so yummy and used in the right way with the right neutral colours can be either very subtle and sweet, or bold and dramatic! 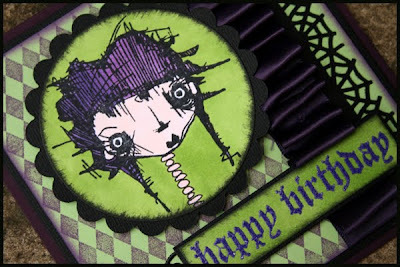 I have used stamps from Stampotique (Girl), Odd Bird Planet (Happy Birthday) and Darkroom Door (Harlequin Background). 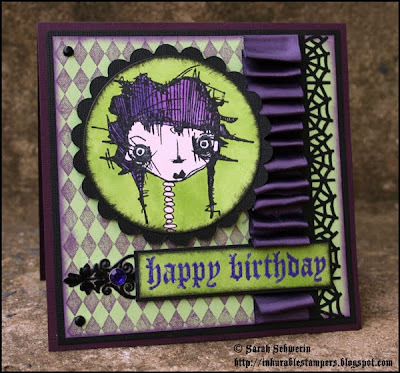 The background was created by stamping the Harlequin Background onto "Apple Crush" Bazzill Smoothies cardstock with Violet ink. I then inked around the edges with the same ink using a sponge dauber. The spiderweb down the right hand side was created on black Bazzill cardstock using a Martha Stewart border punch. I'd had that gorgeous purple satin ribbon in my stash for ages, and I was so glad to finally use it! I adhered double sided tape to the card, and then pleated the ribbon on top of it. The Stampotique girl was stamped with black ink and coloured using Copic Markers. I drew in the neck/spine with a black pen. I cut out the circle with a Nestabilities die, and then inked around the edges with black ink. I then cut a mat for the image out of black bazzill cardstock using a scalloped circle Nestabilities die. The circle was mounted to the card front using foam mounting tape. For the "Happy Birthday" sentiment, I first cut a piece of white Neenah cardstock to size and coloured it with a green Copic Marker. I then stamped the "Happy Birthday" stamp on it with black ink, then heat embossed with purple embossing powder. I inked around the edges with black ink, mounted it onto a piece of black bazzill cardstock, and attached it to the front of the card using foam mounting tape. A purple gem brad, a coupe of brads, and some German Scrap were added also. I then matted the whole piece onto black bazzill cardstock, and the card base is dark purple bazzill cardstock ("Black Orchid"). This was such a fun card to make! If you feel like a challenge and want to give this colour combo a go, pop over to Inkurable Stampers and check out the challenge details!